The Home Remodeling Cost Calculator comes with almost 400 preloaded Labor and Materials costs. The Cost Region adjustment allows you to adjust these preloaded costs to better match costs in your area - anywhere in the United States including Alaska and Hawaii. You can also add your own materials selections. There are two categories of reports - Contractor Reports and Room Reports. Both types of report allow you to show or hide estimated costs. About Cost Settings. Cost settings for repairs that you'll need to do on a typical fixer upper house have been preloaded in the Home Remodeling Cost Calculator. You can change any or all of these settings if you choose to. Changes apply specifically to whatever Cost Region you are in when you make them. So if you work in say Ohio and Florida, the cost changes you make in any Florida Cost Region won't apply to the costs that are used when you choose to use the Ohio Cost Region for a project. 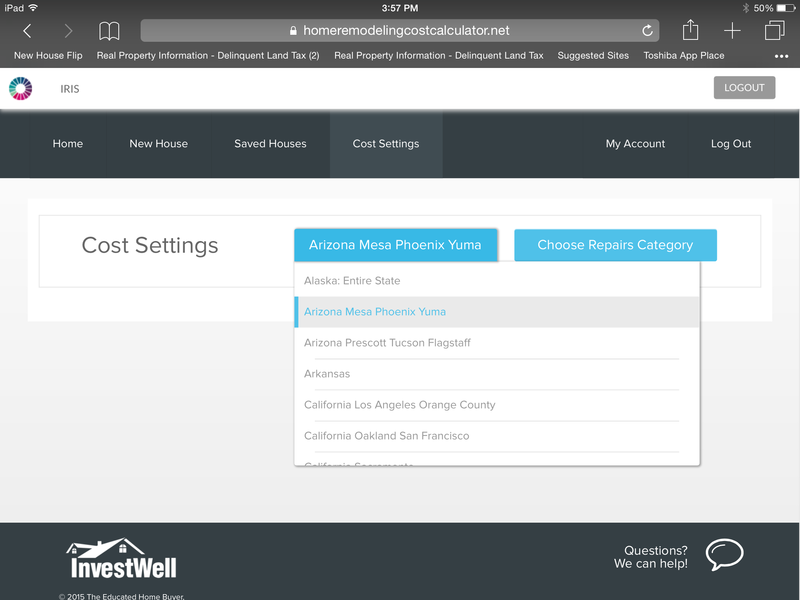 This feature allows you to keep the costs used for each area separate and more accurate. Select Cost Settings from the Main Menu. Choose the Cost Region that you want the new costs to apply to. Select the repairs category that the repair you want to change is in. This will return a listing of all the individual repairs in that category. Select the repair to change. The materials available for that repair and the labor cost will appear. Note that some repairs (like refinish hardwood floors) are set up as labor only (you can add materials to these if you choose to). Change any cost and click on another box - your change is now saved and will be applied any time you select this repair. The default system cost is still available by clicking on the blue question mark (in case you want to change it back). Note that the system doesn't apply cost changes retroactively, so the new cost won't be applied to repairs selected for saved houses. But if you go back to a saved house and add the repair or delete the current repair and add it again, the new cost will be used. To add a material to the preloaded selections, follow the steps listed above to change a repair cost. When you get to the individual repair, you'll see a New Product box on the right. Click that and the New Product entry screen appears. 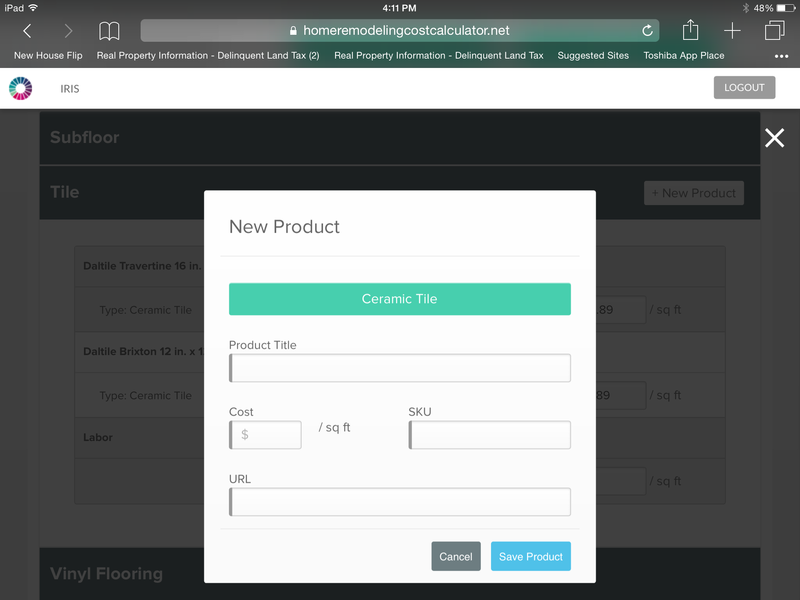 Enter the product information (SKU and URL are optional) and save. Your new material will now appear as a selection in the repair drop down box. TIP: To easily pick out the materials you add, Capitalize your materials names so they stand out in the drop down boxes. 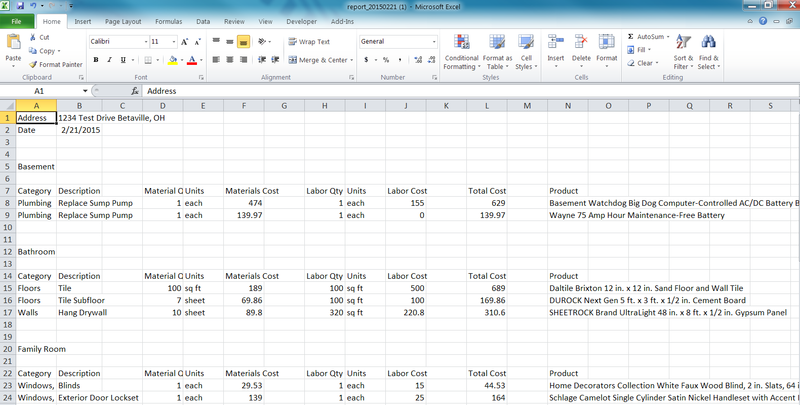 The Reports feature of the Home Remodeling Cost Calculator allows you to create a number of reports in csv format. These reports will open and can be saved on a tablet or PC. They are compatible with Excel, Google Sheets and Numbers. To create a report, access any house from the Saved Houses area. On the Choose rooms for repair screen, reports are located on the lower right hand side. To create a Contractor report, first choose the contractor type report you'd like to create (or the default All Contractors), then choose whether you want to include Materials and Labor cost estimates on the report or not. By choosing to hide costs, you can output a sheet for any contractor (including estimated sq ft or other units of measurement) that includes all work that needs to be done. The contractor can create his bid based on this report. 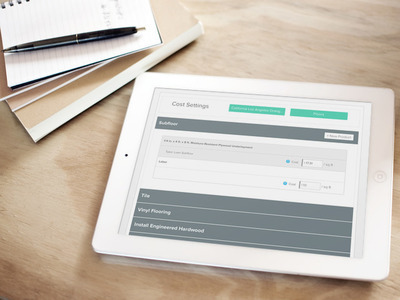 You can use the All Contractors report to track bids vs estimated costs and track a budget. To create a Room report, first choose the room you'd like to include on the report (or the default All Rooms), then choose whether you want to include Materials and Labor cost estimates on the report or not. Individual room reports can be used as punch sheets - hang one in each room of the house to serve as a guide for contractors.